New Hyundai SUVs confirmed | What Car? The all-new Hyundai ix35 and face-lifted Santa Fe will debut at the Frankfurt motor show next month. Our teaser shot shows the ix35 which replaces the Tucson and reveals its badge and a section of the rear light. The picture shows that the rear styling of the production car differs from the ix-onic concept car, with a rear light that sweeps up more sharply from the rear wing. Tweaks are also likely around the rear window, because the high-tech materials used on the concept car aren't yet viable for use on production models. 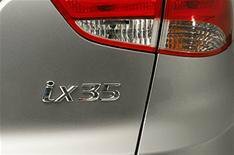 The ix35's front-end is expected to stay true to the ix-onic concept car, though, because Hyundai has confirmed that a version of its hexagonal front grille will be present on its future models. Sportier and lower than the Tuscon it replaces, the ix35 will be a rival to SUVs such as the Ford Kuga, Nissan Qashqai and Volkswagen Tiguan. New 2.0-litre diesel engines that use Hyundai's 'Idle Stop and Go' engine stop-start system will be available, along with a small-capacity petrol engine in entry-level models. Front- and four-wheel-drive versions of the ix35 are expected to be offered, but the four-wheel-drive system is likely to be reserved for higher-spec models. Most buyers are expected to go for cheaper two-wheel drive versions. We expect prices to start at around 15,000. A face-lifted version of the Santa Fe SUV will also be unveiled at Frankfurt, prior to its on-sale date in November. As well as some mild interior and exterior tweaks, it will get steering and suspension modifications for improved dynamics. The Santa Fe will also get a new 173bhp 2.0 diesel, as well as an optional six-speed automatic gearbox, and an updated version of the current 2.2-litre diesel engine. Power will increase from 153bhp to 190bhp, while CO2 emissions are expected to be cut from 191g/km to less than 180g/km.